« So How Much Friction is Present in our Compound Pulley? Last time we ended our blog series on pulleys and their application within engineering as aids to lifting. Today we’ll embark on a new focus series, pulleys used in mechanical devices. We begin with some history, a peek at Swiss scientist and mathematician Leonhard Euler, a historical figure credited to be perhaps the greatest mathematician of the 18th Century. Euler is so important to math, he actually has two numbers named after him. One is known simply as Euler’s Number, 2.7182, most often notated as e, the other Euler’s Constant, 0.57721, notated γ, which is a Greek symbol called gamma. In fact, he developed most math notations still in use today, including the infamous function notation, f(x), which no student of elementary algebra can escape becoming intimately familiar with. 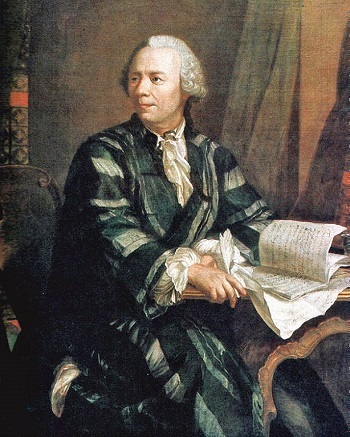 Euler authored his first theoretical essays on the science and mathematics of pulleys after experimenting with combining them with belts in order to transmit mechanical power. His theoretical work became the foundation of the formal science of designing pulley and belt drive systems. And together with German engineer Johann Albert Eytelwein, Euler is credited with a key formula regarding pulley-belt drives, the Euler-Eytelwein Formula, still in use today, and which we’ll be talking about in depth later in this blog series. We’ll talk more about Eytelwein, another important historical figure who worked with pulleys, next time. This entry was posted on Thursday, March 9th, 2017 at 5:33 pm	and is filed under Engineering and Science, Expert Witness, Forensic Engineering, Innovation and Intellectual Property, Personal Injury, Product Liability. You can follow any responses to this entry through the RSS 2.0 feed. Both comments and pings are currently closed.